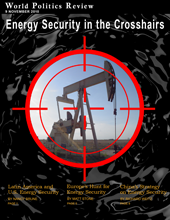 Energy security has increasingly become a watchword in strategic circles, with the world's great powers seeking to both define and achieve it. For China, this means addressing its rising domestic demand for new energy sources. For the European Union, it means accommodating the diverse interests among its 27 members while coping with Russia's assertive energy policies. The United States, in turn, must revitalize its neglected energy relationships with its Latin American partners to reverse troubling trends. All must manage their role in the increasingly competitive global energy landscape without disrupting the stability of the global order. For much of the last half-century, the U.S. has failed to engage the nations of resource-wealthy Latin America in any strategic manner. This lack of attention to our closest neighbors, and some of our strongest allies, is dangerously short-sighted given U.S. dependence on Latin America as a source for our energy. Despite repeated declarations by this and the previous administration about expanding cooperation on energy security, little has been done to put those words into action. The rapid economic growth of the People's Republic of China has fueled a demand for energy that has now outstripped domestic sources of supply. China can no longer sustain its economic expansion without importing massive quantities of energy. To compensate, the Chinese government has pursued an ambitious "energy diplomacy." But in the process, the PRC has caused alarm among other countries, who worry that Beijing's vision of a zero-sum world energy game could threaten their own energy security. Since Russia's January 2009 cutoff of gas supplies to Ukraine, European leaders have prioritized energy security as a matter of "high politics" to a degree never before witnessed. As the events of early 2009 illustrated, that means crafting a coherent energy policy for Russia and Central Asia that has buy-in from a majority, if not all, of the EU member states. Doing so requires overcoming schizophrenia in European policymaking circles about both Moscow's intentions and how it uses its energy exports to achieve its foreign policy goals.